Our beloved Memsahib has been sold to a very nice fellow from Boston who is now living in Puerto Rico. 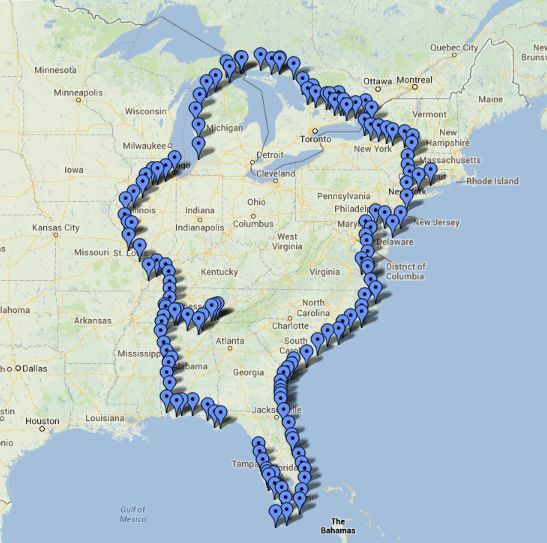 I worked on her all spring on his behalf getting her in super shape for 1,100 miles of blue water between Miami and Puerto Rico. She’s a better boat now than she was on the Loop — and she was a great boat then. Building wooden boats is ALMOST as good as cruising on them, and it takes place in Guilford, CT rather than Demopolis, AL, where we were (pleasantly) stranded last year. If anyone is interested, or knows anyone who MIGHT be interested, our beautiful, strong Memsahib is for sale and wants to Loop again. She just got back from a show in Mystic and is in the best shape ever. John came back from his camp counselor job so we could attend the Antique and Classic Boat Rendezvous at Mystic Seaport. 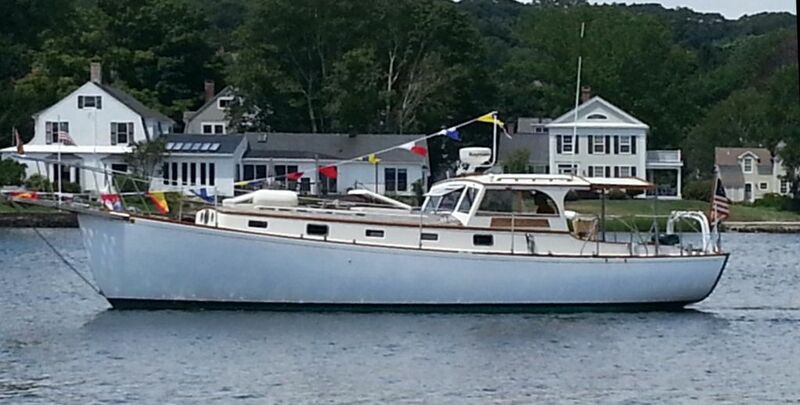 It’s a by-invitation deal for really classy boats, so we were honored to attend. Weather was great and hundreds of people visited Memsahib. It was her first time out of the slip since completing the Loop and it felt wonderful to be cruising again. I will post the story I’m writing for the Looper website. Transitioning from the Loop hasn’t been hard, hasn’t been easy, it’s just been strange. After 50 years of total focus on school, work and the Loop, coming back to a great but disjointed life was confusing. Literally the day after we landed, it was off to Miami University of Ohio, a 1300-mile round trip for orientation. Then continued moving in to our new house, re-contacting old work friends, setting up my beautiful new shop, and a zillion other distractions. Wonderful to be home with Molly, but hard to shake that, “Weather’s good, ought to be getting going, ought to be on to the next port” feeling. I tell my friends it’s like an old science fiction show: Two astronauts have an accident and land on another “earth” that is exactly, exactly opposite our earth from the sun. They think everything is okay until they start watching TV in the hospital and see an address from President Al Gore, an ad for Kentucky Fried Guinea Hen and a sports report about the Chicago Cubs sweeping the World Series for the third straight year. They get back, but it ain’t easy. I have not even visited this blog since returning — too strange, too disjointing. But I’m better know. I really love the new shop and am building a cool wooden paddle board for a friend. I’ve done some consulting from the very best of my old vendors, and most of all, I’ve started planning a short cruise for the fall and more for next summer. We really need a smaller, lighter boat for the type of cruising we want to do in the future, but if it’s good old Memsahib, it’s good old Memsahib. At the show with our official, 139-dot Great Loop map. Memsahib steaming down the Mystic River all spruced up for the show. We’re home. 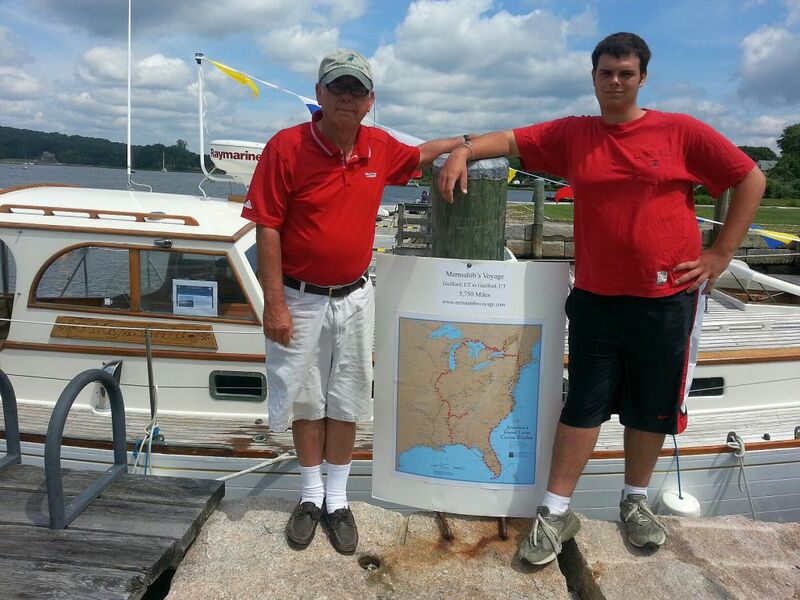 Pulled into our slip at Guilford Yacht Club today 350 days and 5,750 miles after we left. We all have such moments. They could be brought on by the birth of a child, catching one just right and pumping it 300 yards right down the middle, or just sitting by the fire contemplating your incredible luck in being born an American. I think the people I’ve known who are truly living are simply trying to maximize moments of euphoria through sports or a job they love or family or church or whatever. If you like the water, boats, history and our wonderful country and it’s equally wonderful neighbor Canada, the Great Loop is a euphoria factory. 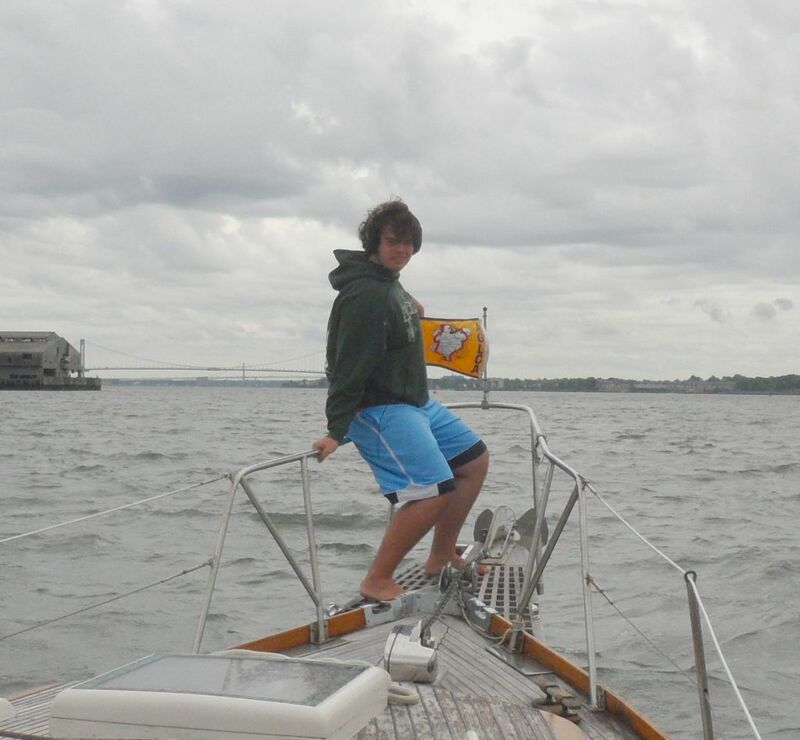 Euphoria lies around every bend, across every bay and at every dock where the Looper flag flies. There were simply hundreds of times during our trip that I just FELT SO GOOD about what John and I were doing. – Swimming with Bjorn in a perfect lake in a perfect anchorage on a perfect day in the Stony Lakes region of Canada prior to a martini and steaks on the barbecue. – Dinner with John and Molly at a classic Chicago steakhouse after a beautiful day doing the sites in one of America’s great cities. It was so good to be a family again. – The confluence of the Mississippi and Missouri Rivers – Memsahib cleaving the same waters as my boyhood heroes Lewis and Clark. – Cold as could be, but motoring through the Tennessee Gorge at the absolute peak of the fall colors with my great friend Eric Brazil. – Seeing all the Loopers in the Tiki hut at Green Turtle Bay after our tough Gulf crossing and being handed the by-now-famous Next to Me Bloody Mary. – Skimming over the waves, rays and turtles on a seaplane to the Dry Tortugas. – Anne Marie Sales was John’s nanny as an infant and little boy. Seeing her little three-year-old girl “driving” Memsahib just as John drove Memsahib at the same age was a special moment. – Belting out “Moon River” ON the real Moon River. 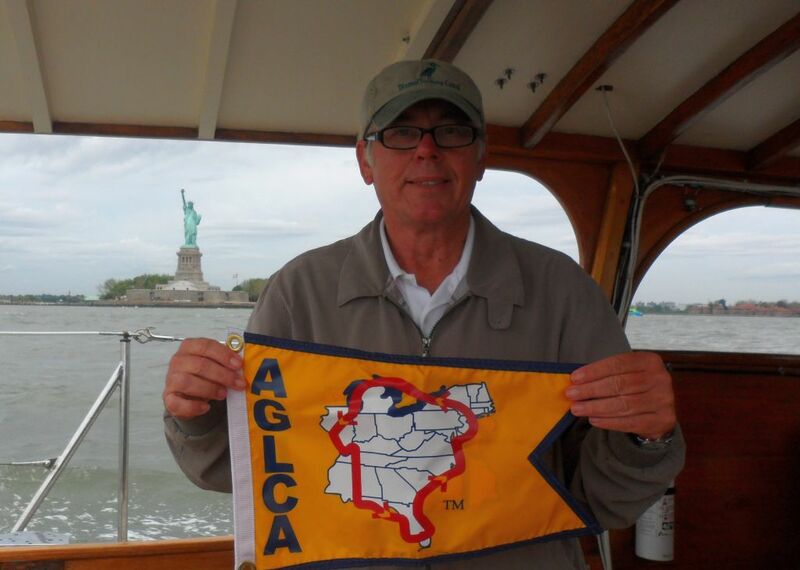 – Motoring up the Choptank and Tred Avon Rivers into the heart of Michener Country. When I read “Chesapeake” 35 years ago, I said, “I’ve got to go there.” And I did. 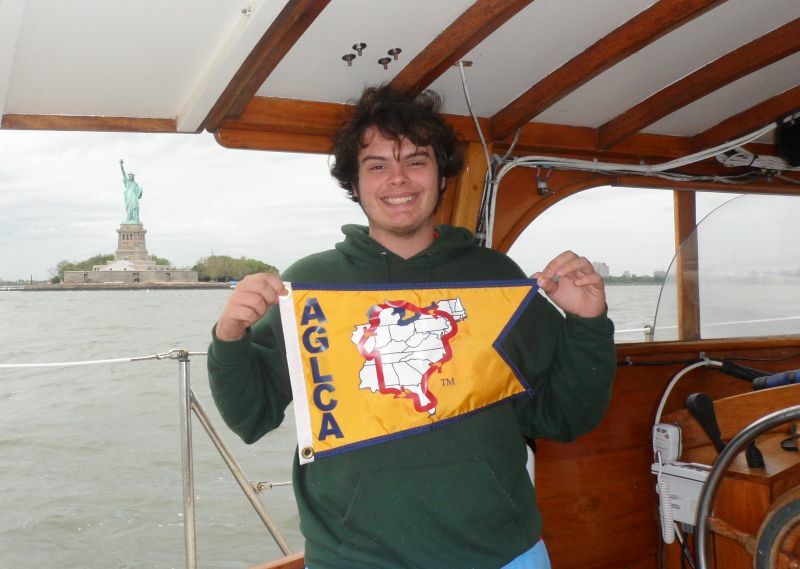 – Taking a picture of John holding the Gold Looper flag in front of the Statue of Liberty. I could barely push the button. That’s the end of the voyage and the end of this blog, although we will be adding pictures of the first two months of the trip before the blog began. 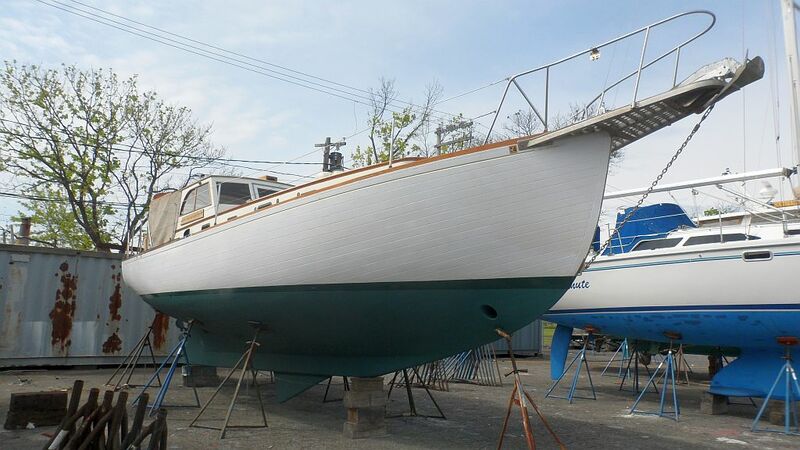 More practical thoughts on the Loop, future cruising tales and boatbuilding yarns will move to http://www.greatloopcoda.com.